Creek Reads Book Club Success! On Wednesday, 12 students met in the library to enjoy a stimulating conversation with author Holly Bodger. They discussed the ideas and themes in Holly’s novel, 5 to 1, as well as the joys and difficulties of the writing process, finding inspiration, and other great YA novels. For more about the book club meeting, click to check out this great article on the Indian Creek School website! The Creek Reads Book Club! In less than one month, friends, the library will be hosting our first ever Creek Reads Book Club! I’m very excited for this new program and I hope that we get plenty of students participating in what will surely be a really fun hour of discussion about the book 5 to 1 by Holly Bodger. If you haven’t read the Creek Reads blog review of this book yet, check it out here. In short, this awesome novel takes place in near future India, where boys outnumber girls by a ratio of 5 to 1. In the walled city of Koyanagar, Sudasa is now marrying age and that means that she must judge 5 boys who are selected to compete in the Test to become her husband. Sudasa does not want to be married – for her, marriage is simply another form of enslavement. Kiran, one of the boys competing for Sudasa’s hand in marriage, is also scornful of the Test and the society in Koyanagar. As the Test progresses, Sudasa and Kiran try to break as many rules as possible, usually to the detriment of the other’s plans. Told in alternating chapters of verse and prose, this novel raises questions about gender roles and stereotypes, the consequences of greed and the misuse of power, and the value of choice. During the book club, we’ll be joined by the author, Holly Bodger, via Skype! Holly hails from Canada and 5 to 1 is her debut novel. She’ll be present on the big screen to answer questions about her book and the writing process. If you’d like to join the Creek Reads Book Club, please grab a copy of 5 to 1 at your local library, bookstore, or download it and come prepared to discuss! Any and all NaNoWriMo participants are also welcome to join to discuss writing and publishing with Holly. The Creek Reads Book Club will meet on Wednesday, October 28 during Advisory. Please sign up in the library to secure your spot – there are 20 seats available! Be sure to ask your advisor for permission to attend the meeting beforehand. Here’s a new twist on the old dystopian society trend in young adult literature! 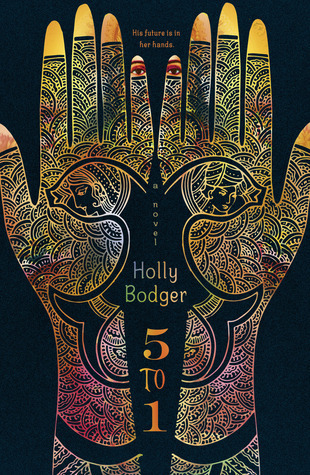 5 to 1 by Holly Bodger is set in 2054, when boys outnumber girls by a ratio of 5 to 1, making girls a precious commodity in India (where female infantacide is a real problem, BTW). In the fictional walled-off city of Koyanagar, boys must compete in the Test for the chance to marry one of the few girls of marrying age each year. They compete in tests of skill, athleticism, and knowledge, and in return receive rocks from the eligible young lady. The boy with the most rocks gets the girl and, hopefully, is able to produce another girl from their marriage. Sudasa, one of the two main characters, is seventeen years old and her time for marriage has arrived. She has no choice in the matter, other than which of the five masked boys before her she might choose to be her husband. She knows that she should be obedient to her grandmother’s wishes and marry the boy who is obviously from a good family, a boy who will give her daughters and maker her life comfortable. But Sudasa is disgusted with the entire Test, with Koyanagar, with her grandmother. Sudasa’s name might mean obedient, but she wants only to rebel. Kiran, the other main character, is a farm boy from the coast of Koyanagar who has been chosen as one of Sudasa’s five “suitors.” Like Sudasa, he is also disenchanted with the Test, but then, none of the boys are looking forward to the competition. After all, there is only one winner, and the losers are forced to live a life without marriage, companionship, fatherhood. Or worse, they are sent to the walls that surround Koyanagar, supposedly to keep the people from the old country from breaching the walls in an effort to get at the resources (coal, food, water, girls) inside the city. Kiran knows that he can’t win his Test, but he doesn’t care. He has other plans, to break out of the city and go in search of his missing mother. All he needs to do is remain unnoticed until the Choosing Ceremony and he’ll be free to run… until Sudasa starts to notice him. Can these two helpless teens, swept up in the mistakes of their ancestors and forced to suffer the consequences of hundreds of years of greed and short-sightedness, help each other escape the vicious cycle? Or will scheming family members, state-sanctioned killings, and indecision each play their roles to stop these teens who just want to be free to love, or not love, as they wish? This book has a lot of great stuff going for it: interesting concept, cool setting, likable characters, easy to read. Sudasa’s chapters are written in verse and Kiran’s chapters are in prose, which makes the book a quick read and makes it easy to distinguish between the two characters. The very thinly-veiled pro-life message in the book might be off-putting for some, but the book’s basis in reality will certainly bring more attention to the problem of female infantacide and gender selective abortion in India. This book will get readers thinking about stereotypical gender roles, how women and men are treated by the opposite gender, and how these trends might evolve in the future. All in all, this a great book if you’re looking for a quick read with a new twist on the dystopian trend. Fans of Sold by Patricia McCormick, Koyal Dark and Mango Sweet by Kashmira Sheth, and The Handmaid’s Tale by Margaret Atwood might enjoy this little book.